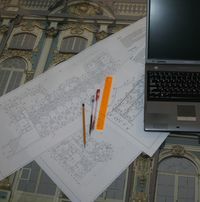 Architectural measurements is the main field of our company activity. We suggest the full range of measurement survey, including facade measurements, measurements of inner spaces of the buildings, interior measurements. As a result we produce measurement drawings in the uniform coordinate and height system, in format .dwg. Our specialists have rich 12-year experience gained in work with about one hundred objects. Modern technologies and high degree of professionalism are the guarantee of successful results. We are proud of respect and trust of the Committee for State Control, Use and Protection of Historical and Cultural Landmarks and the main Saint-Petersburg design and restoration companies.